Doctor Who is often celebrated for its infinitely flexible format. And given that fact, it seems churlish to complain when it produces an episode of sci-fi sitcom infused with the language of our age. Emotional journeys, and giving it 110%: Gareth Roberts has got an app for that. Because this is very, very funny Doctor Who, fizzing with wit and containing some great sight gags. The lift that’s obviously a teleport; the changing room Cyberman adding a whole new meaning to ‘cyber-conversion’ - what's not to love? And yet it should all have been so dark and desperate, witnessing the Doctor’s last days before Lake Silencio. We know his fate is closing in because we’re given the necessary visual cues: those blue envelopes (lucky that Craig and Sophie opted for TARDIS-blue stationery), receipt of a Stetson, and underwater River, ready and waiting. The iconography is brought into place, with everything wrapped up in a neat gift box ready for next week’s finale. I have one nagging question, mind you: how does the Doctor know for sure his time is up? Why can't he disappear off through time and space, deferring his visit to America and its fatal fixed point? Setting aside this logic puzzle, Craig Owens makes a superb companion. Again. Personally, I suspect we’ll see him for a third time in 2013 if not before, James Corden’s schedule permitting. Sadly, however, Amy and Rory’s involvement is restricted to an in-joke, in-store promotion: Petrichor, 'For the Girl Who’s Tired of Waiting'. The scent of Moffat-Gaiman-MacRae referencing seems present just to ensure that Karen Gillan and Arthur Darvill make the end credits, thus preserving last week’s surprise ending. Moffat knows all the tricks: he knows fans will be scouring cast lists, so the inclusion of Amy’s autograph scene feels calculated to defeat spoilerphiles. And although the moment is a massive coincidence, it's played for laughs as a coincidence. At the same time it has emotional clout built out of our affection for the TARDIS family – a story-beat whose bittersweet sentiment very definitely feels genuine rather than shop-bought. Even if coincidence is "what the universe does for fun”, this 'Doctor Who Coincidental' tugs at the heartstrings. In an episode which switches companions, Roberts craftily plays with the meaning of ‘companion’. Not only does he riff on it as an old-fashioned term for partner in Val's subplot, he further integrates it into the “Time Lord and a man and a baby” storyline thanks to the Doctor’s comparison between his human companions and “sweet”, disarming babies. It’s cleverly done, with a suitably light touch, making the Doctor’s assistants a subject of humorous banter ("you're my baby!") rather than melodrama. Simultaneously, the Doctor becomes an assistant – “here to help” – and although showing him as a servant of capitalism seems more than a little incongruous, the episode promptly undercuts this meaning. Because the Doctor isn’t a shop assistant; he’s a universal assistant. “I was here to help” he tells three child bystanders, and suddenly we hear their adult voices speaking from the future. It’s a dizzying, glorious moment of time travel across human lives and memories. And occasionally Closing Time likewise jolted me back through time: Shona exploring the eerie emptiness of a Henrik’s-a-like store reminded me of Rose, while the silver rat Cybermat transported me back to watching Tomb of the Cybermen on video. Gareth Roberts can’t resist adding another layer of subversion, though, so we get an implicit acknowledgement that certain Doctor Who monsters might be introduced for their merchandising potential. As such, the Cybermat is a monster mistaken for a toy from the word go. The stock room of Sanderson & Grainger may say “there’s no such item”, but I’d put money on it becoming a real-world plaything before too long. This isn’t simply well-written comedy, it’s a well-written episode, full-stop. We get an ‘A’ story – the Doctor helping Craig to cope with baby Alfie, or Stormageddon, Dark Lord of All as he prefers to be known. 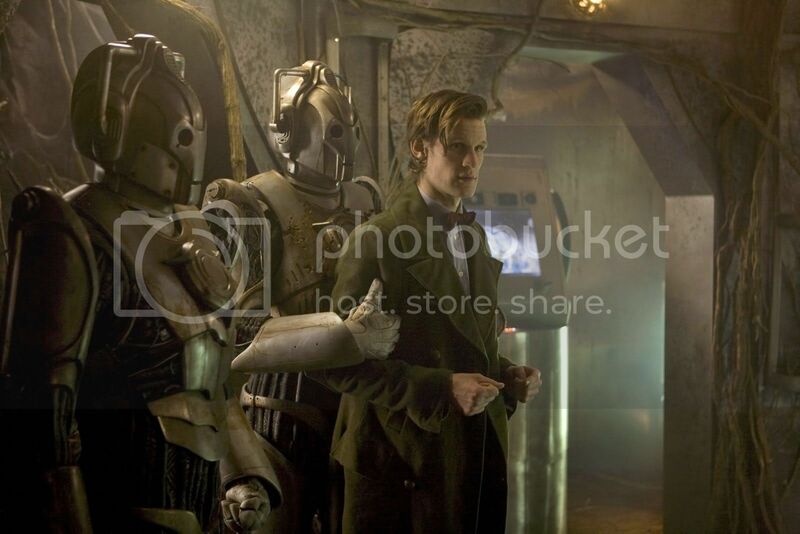 Plus we get a ‘B’ story – a subplot (and it is pretty much a subplot) featuring Cybermen who are busy shoplifting department store assistants to build up their forces. Then there’s a neat dovetailing of plots A and B at the crucial moment of resolution, as Craig blows up the Cybermen “with love” for his son. Looked at from a screenwriting perspective, it all works with machine-tooled precision. Still, I can’t help the feeling – and it’s a feeling strong enough to reboot emotional subsystems – that the Cybermen are defeated far too easily here, even if they are a low-grade outfit cobbled together out of “old spare parts” rather than being the real deal. Cyber-conversion can be reversed by a parent’s love now? Let's face it, these bargain basement Cybermen were never likely to succeed in taking over Colchester, let alone the world. For me, the conclusion slightly cheapens one of Doctor Who’s iconic monsters, as well as being “grossly sentimental and over simplistic”, as the Doctor himself points out. OK, the dialogue is part of yet another gag, but it’s a fairly high-risk one, going for an off-the-shelf emotional ending while illuminating its ersatz sentimentalism. And despite poking fun at the “emotional journey” associated with Britain’s Got Talent – or Torment – it’s the Doctor’s emotional journey, as much as Craig's, that we follow through this episode. The Cybermen may threaten to remove emotion, but Closing Time generates sentiment at the same time as mocking its formulaic manufacture. In a slightly queer, unstable way, it's never quite sure how it feels about feelings. But never mind that, because I've got an appointment I can't miss. A fixed point in time. Yes, next week is The Wedding of River Song. What did you think of Closing Time? Vote in our poll here.